YuMEGA Boost provides vital nutrients to promote hair growth, aid skin health, and support nail strength when your dog needs a little extra help. 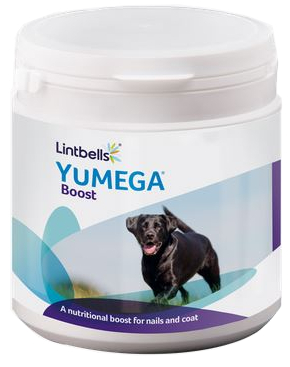 How does YuMEGA Boost help get your dog coat and nails back to full strength? In a nutshell, YuMEGA Boost provides your dog with vital nutrients to help reduce dog hair loss and strengthen their nails. Lecithin provides a concentrated source of phospholipids and fatty acids – essential for healthy coat growth. Zinc plays an important role in skin condition and is an essential component for hair growth. Vitamin C & E are important antioxidants which help maintain healthy skin. Biotin is essential for keratin formation and supports growth and repair of hair, skin and nails. Mannan-oligosaccharides support healthy digestion so your dog gets gets the best from its food for skin and coat condition. Simply add the recommended amount to your dog’s food each day, based on their weight. Using YuMEGA Boost for the first time? It’s important to give your dog time to get used to new things you introduce into their diet, so try using a small amount to begin with, before moving up to the recommended amount for your dog. There are currently no questions for YuMEGA Boost - be the first to ask one!